From 21st to 23rd March 2019, it was all about electronic commerce at the seventh eCommerceCamp in Jena. Developers and shop system integrators shared their ideas and experiences. As in previous years, the focus was on technical innovations and effective solutions for ecommerce. Inpsyder Frank Bültge was there too and gave two sessions at the barcamp. Find out more about eCommerceCamp 2019, why electronic commerce is important to Inpsyde and which topics we want to promote in this field. As WordPress Agency and Gold WooCommerce Expert electronic commerce is one of our focal points. We have a lot of experience in fields like usability, performance, security, SEO and deployment. To us it is important to evolve ourselves constantly and also to develop ecommerce. Ecommerce is growing constantly, proceeds are rising. The task now is to optimize processes for providers and customers. Keyword: Digitalization. This does not mean technologization, i.e. a mere conversion from analogue to digital. It’s a lot more than that! Digitalization means in this case: to largely optimize processes, to make use of modern technologies for this purpose and to integrate the right tools as efficiently as possible. In a nutshell: Digitalization means reorganizing processes and adapting them to technical progress. In many cases this requires rethinking. Because Inpsyde has worked remote from the beginning, we’ve always worked digitally. So we know what matters. But we never stop learning! So, eCommerceCamp in Jena was definitely valuable for us. There was a lot going on at eCommerceCamp 2019! As ecommerce is growing steadily and so are the needs and expectations of providers and customers. This is shown above all by the thematic focusses of the eCommerceCamp 2019. Besides questions concerning technical challenges like performance there was also talk about AI and machine learning. 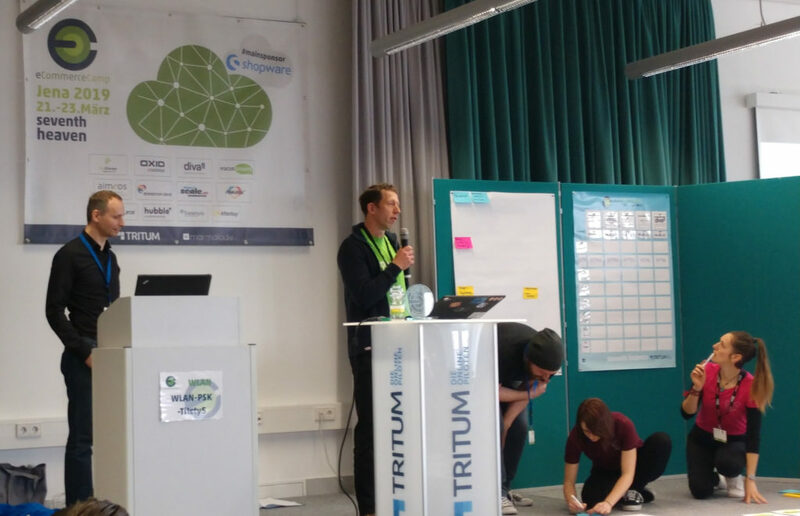 Inpsyder Frank has also held two sessions at eCommerceCamp 2019: remote work and deployment. At this point, we give an insight into the contents of his session about remote. Inpsyde is a German pioneer in this field and we want to share our experiences! The biggest advantage of remote work is certainly that it provides spatial independence. Employees don’t have to live nearby their company anymore. There are no commutes to work and it is much easier to hire experts from other countries. However, this also gives rise to difficulties. If Employees are from all over the world not only linguistic but also cultural, temporal and legal hurdles have to be overcome. Good organization is particularly important for remote work. Especially the communication within the company has to function smoothly. To achieve this, it is essential to make effective use of certain communication and planning tools. This also means that every employee must be familiar with them! In addition, the employees have to organize themselves. To work in the own four walls requires discipline! Nobody looks directly over your shoulder. Furthermore, you don’t see your colleagues personally. Not everyone can deal with this kind of isolation. That’s why it is important to deal openly with this subject when looking for an applicant.